Firestone Country Roads Stage at Ascend Amphitheater Presented by BBR Music Group kicks f the festivities Thursday night. Headliner Chase Rice will be joined by Jimmie Allen, Blanco Brown, Adam Craig, Lindsay Ell, Tyler Farr, King Calaway, LOCASH and Runaway June. As part its partnership with CMA Fest, Firestone will create unique experiences for festival attendees through both its interactive space at Xfinity Fan Fair X inside Music City Center and the popular nightly concerts on the Firestone Country Roads Stage at Ascend Amphitheater. As a fan favorite for the past two years, each nightly show will feature an exciting list country music stars from some the industry’s leading labels and management partners, including Broken Bow, Red Light Management and Warner Music Nashville. Full details on activities and activations will be announced at a later date. CMA and Nashville-based Futureshirts have just released even more new merchandise items online at shop.cmafest.com. 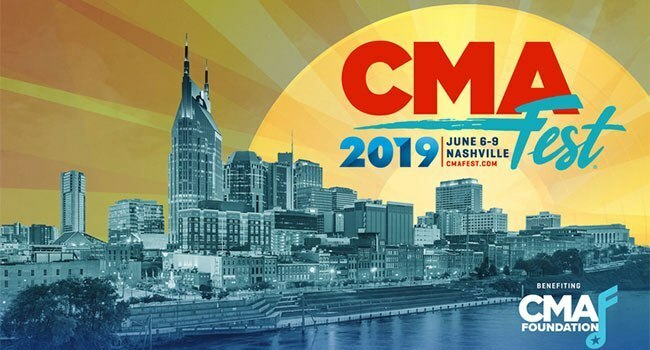 Recently released CMA Fest essentials include sunglasses, plastic water bottle, sunscreen and more! Order by Tuesday, May 28th to receive in time for the festival. Fans will also be able to purchase ficial merchandise at several locations across the festival footprint in June.